Did a Business Ban Their Employees from Wearing Nike Products in the Workplace? In September 2018, a company banned their employees from wearing Nike products in the workplace. Nike’s announcement of an advertising deal with Colin Kaepernick prompted a storm of controversy and debate, as well as widespread calls for a boycott of the company by those opposed to National Football league protests against racial injustice, which Kaepernick led by “taking a knee” during the 2016 season. None of the social media posts containing the photograph provided any details about where the sign was posted, the company that posted it, the person who took the photograph, or when the picture was taken. Similarly, the sign itself was devoid of any details, logos, signatures, or watermarks that might give a clue as to its authenticity. 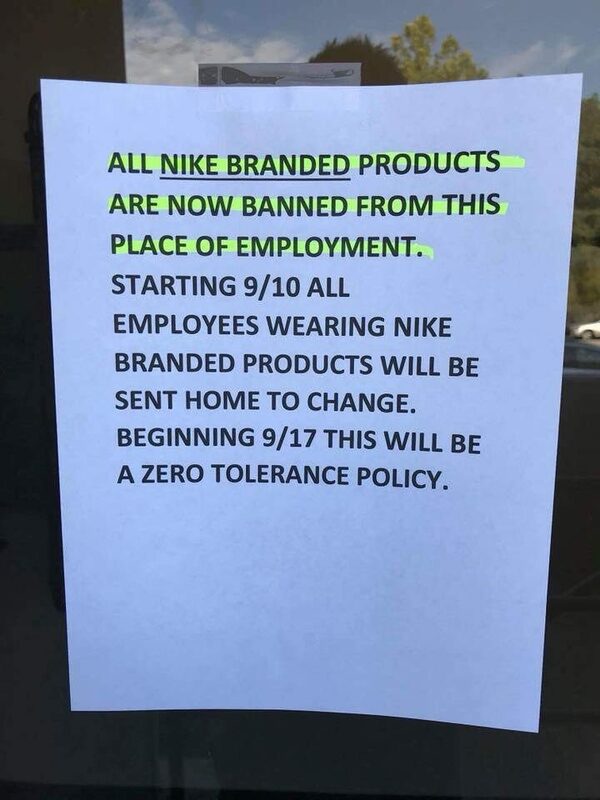 For that reason, we have not yet been able to verify whether the sign was posted and photographed as a hoax, a prank, or a joke, or whether the management of some as-yet unknown company posted the sign in earnest outside their offices as part of a genuine policy banning the wearing of Nike apparel.